This is in good shape but a couple of pieces have been put together. The kit looks to be complete. Only taken out of box for photos and inspection. Toybiz plastic model kit set. ghost rider kit is complete with box. get this great hero team-up for a great price. what you see is what you get. sold as is. ask before buying. CAPTAIN AMERICA MARVEL HERO HORIZON Vinyl Model Kit HMO14 1990 RARE!! New in opened box, 1/6 scale, 13" tall, high quality, fully detailed vinyl model kit, Horizon 1990 Marvel Comics. ACTION HERO VIGNETTE. NO GLUE OR MODELING SKILL REQUIRED. DRAGON MODELS. The use of model kit techniques allow us reproduce the intricate details and sharp lines to maximize the usage of the official 3D character scans. Marvel Machines. Hot Colors & Super Hero Graphics. Snap Together Plastic Assembly Kit. No Paint or Glue Required. This is a rare & early model kit by HORIZON. 2 - 3 lbs. Illustrated step-by-step constructions make this 3D puzzle quick and easy to build. This is a resin model kit of the COP .357 Derringer pistol carried by the Winter Soldier as a holdout pistol in the Captain America films. This prop is often used in sci-fi and can also be seen in Blade Runner and Battlestar Galactica. Kit is cast in three pieces of solid resin, gray for the body and black for the grips. A great prop to complete your Winter Soldier costume. Kit requires finishing and painting to make the completed prop shown on the box, resin kit finishing instructions are included. Kit is cast in solid, high-quality artist-grade resin, not 3-D printed material. Prop is full-sized, 1:1 scale, and measures approximately 5.5 inches long and 4 inches tall. This is a static prop kit with no moving parts and, of course, cannot be made to fire anything. 3D Laser Cut Models. One 4” x 4” full color steel sheet. Difficulty: Easy. Pre-Painted, Snap Together Model Kit - Skill Level 1. No Paint or Glue Required! Hot Colors & Super Heroes Graphics. Professionally painted by an Award winning make up artist and painter. The details are uncanny. 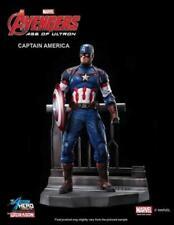 Loot Crate Marvel Gear & Goods Collectible Captain America Shield 3D Wood Model Condition is New. Shipped with USPS First Class Package. Marvel Lootcrate box item. June 2018. Captain America Civil War 3-D wood model. Never opened brand new. Eco-friendly. No glue or tools needed. Ages 12 and older. MARVEL AVENGERS CAPTAIN AMERICA PAPER CRAFT DIE CUT 12 INCH POSEABLE FIGURE~NEW! Marvel Captain America Ultimate Collection Peel &Stick Poster Model Kit $20 OFF! Easy to apply - just peel and stick. Item number 48622, dated 1998. This item is sealed and has never been opened. Model: RMK1804GM. Studio: RoomMates. Publisher: RoomMates. Brand New, from a smoke-free, pet-free home. Shield Launcher. Set obstacles and create different challenges on the large activity board. • No Glue or Solder Needed. Difficulty: Easy (Single Sheet) Assembled Size: 1.5" x 1.5" x 2.25". Steven Rogers was born in the Lower East Side of Manhattan, New York City, in 1920 to poor Irish immigrants, Sarah and Joseph Rogers. Still in the box but not great condition on the box---what is pictured is included--check for anything missing--SOLD AS IS! Looks like missing instructions for sure--. After being dropped behind enemy lines. With a quick step and a force-ful thrust of his shield. Made by Toy Biz in 1998 and long out of production. Paint and glue required (not included). Make sure this fits.